The Macedonian language is in the same family as Russian, Serbian or Bulgarian, but is distinctly different. Have in mind that, the official alphabet in Macedonia is the Cyrillic, but Latin is used also. 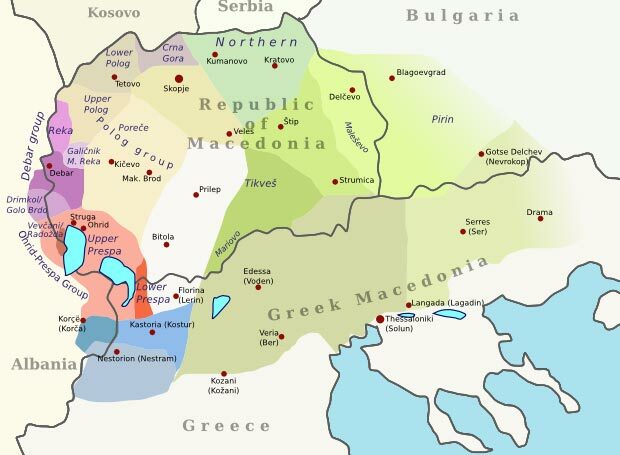 Based on a large group of features, the Macedonian dialects can be divided into Eastern and Western groups. Kostur - Gorica group consisting of Korçë (Gorica), Kastoria (Kostur), and Nestram. Eastern Group consisting of the entire eastern part of the Macedonian region including the Kumanovo - Kriva Palanka, Stip - Strumica, Tikves - Mariovo, Malesevo - Pirin, Lower Vardar (Edessa/Voden, Kilkis/Kukus, Pella/Postol, Thessaloniki/Solun), and the Serres/Ser - Goce Delchev/Nevrokop sub regions. In 1845 the Russian scholar Viktor Grigorovic travelled in the Balkans in order to study the south Slavic dialects of Macedonia. His work announced to the world for the first time the existence of two separate Bulgarian dialects: Eastern and Western. According to his findings, the Western Bulgarian variety, spoken in Macedonia, was characterized by traces of Old Slavic nasal vowels. It wasn't until the works of Krste Petkov - Misirkov that parts of what had been regarded as West Bulgarian dialects were defined as a separate "Macedonian" language. Misirkov was born in Pella (also known as Postol) in Greek Macedonia (or Aegean Macedonia). Although literature had been written in the Slavic dialects of Macedonia before, arguably the most important book published in relation to the Macedonian language was Misirkov's "On Macedonian Matters", published in 1903. In that book, he argued for the creation of a standard literary Macedonian language from the central dialects of Macedonia which would use a phonetic orthography. The Macedonian language was proclaimed the official language of the Republic of Macedonia at the First Session of the Assembly for the National Liberation of Macedonia, held on 2nd August 1944. The first official Macedonian grammar was developed by Krume Kepeski. One of the most important contributors in the standardisation of the Macedonian literary language was Blaže Koneski. The language is spoken by approximately 1,6 million people in the Republic of Macedonia. It's beleived to be the mother language of 2,5-3,5 million speaker in the entire world, since many Macedonians live abroad. It is difficult to determine the total number of speakers of Macedonian due to political issues and emigration.